Gordon Ramasy knows lamb too. 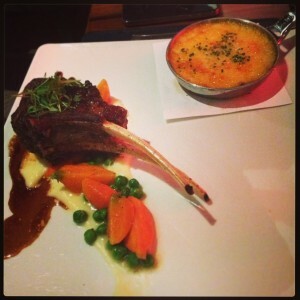 Had these beauties at his restaurant in the Paris Hotel in Las Vegas…”Duet of Lamb” was outstanding! Shepard’s pie, chops, peas and carrots was an amazing dish. At Gordon Ramsay, Paris Hotel, Las Vegas. I’m going to recap three recipes I’ve recently tried and what I’ve learned. First was a roasted rack of New Zealand chops, frenched by the butcher. 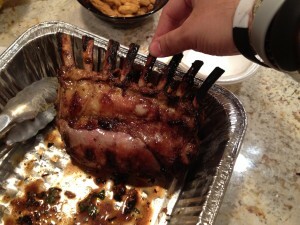 I rubbed them with some oil/herbs and roasted the rack in the oven at 375F for 10 minutes per pound. In a Good Eats episode, Alton mentions how little a marinade matters in penetrating the meat, and I agree; however, roasting allows for a nice crispy crust and adding a marinade gives the exterior time to absorb the flavor. If you use a citrus, or as I’ll talk about later some yogurt, then the meat will more tender. If you are marinating chops that are pre-sliced, the effectiveness of the marinade will be much stronger (more surface area) so be careful how much you use and how strong it is. 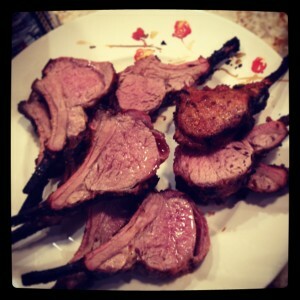 I’ve also become a big fan of Indian lamb chops, tandoor style. As acquiring an actual tandoor is not in my scope, using the flavors and roasting in the oven or grilling them in the summer is an awesome comparison. The keys for this recipe are high heat and a long pre-marination. Typically, the chops are separated and marinated for 3 days in a yogurt-based marinade along with a host of spices (cardamom, cumin, corriander, chili powder, garlic, lemon, salt, pepper, green chiles, cinnamon, mace, and whatever other tweaks you like). The combination of yogurt, lemon and long marination makes for a super tender chop when cooked at a high heat for 6-10 minutes depending on your heat source/level. 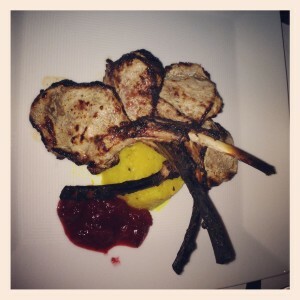 Lamb chop dish at Tulsi, served with masala potatoes and a cranberry chutney. 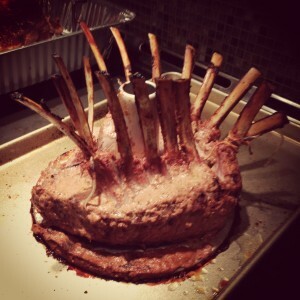 This past Thanksgiving I decided to try a twist on the traditional crown roast and combine the Indian tandoor marinade on two racks and forming a Raja’s Roast! As the marinade had less surface area than if the chops were separated, the flavor wasn’t as deep, but they still turned out fantastic–leftovers were even better! I may try slicing the ribs pretty deeply before marinading next time to deepen the flavor but still pull off the shape. I used Alton Brown’s idea to use an angel food cake pan as the mold because of the spigot in the center (a bundt cake pan would have been ideal, but we didn’t have one). Since I frenched these myself, I minced the meat and made stuffing out of it, which was pretty good, although quite gamey. Next time I would try using the finger bits for stew. I also would try braising next. Since there is a decent amount of tissue around the bones and not that much fat, a quick sear in a pan of sliced chops followed by a beef bourguignon style braise (red wine, thyme, rosemary) followed by a reduction of the liquid with dried fruits herbs and mounted with butter should be a show stopper. I loved seeing this recipe done in the Good Eats episode Fermentation Nation.